Heavy equipment digs into Fourchon Beach searching for more of the massive oil mats left by the BP blowout in 2010. “I’ve been told by the ocean experts this stuff could hang out there on the bottom of the Gulf for more than 100 years. And as long as it’s out there, it can come ashore,” said Robert Barham, Secretary of the state Department of Wildlife and Fisheries, in 2010. The accuracy of that prediction is visible once again on the Lafourche Parish beach between Elmer’s Island and Port Fourchon, where a line of mud haulers waits to collect BP oil being unearthed by giant excavators digging just yards from the Gulf waves. According to the U.S. Coast Guard, in the past few weeks this one spot has yielded 1.5 million pounds of “oily material” – a designation that includes oil products as well as associated shell, sand and water. And that’s in addition to 1.79 million pounds already collected from Fourchon, by far the largest share of the 8.9 million pounds recovered from all Louisiana beaches in the past two years. The heavy ongoing cleanup is emblematic of the problems spill experts say Louisiana can expect due to the rapid erosion of its coastline, especially along the beaches between Grand Isle and Port Fourchon. The rapid shoreline retreat in this area has resulted in a silt-filled backwash in the nearshore shallows. Patches of Deepwater Horizon oil that reached this zone became embedded with sand, shells and mud particles in the water column, creating malleable tar balls, patties and mats, depending on their size. These are more than mere eyesores. The weathered oil contains toxic hydrocarbon components than can remain a threat to fish, wildlife and human health for 50 years. So even small tar balls must be cleaned up. Gunk not quickly collected by cleanup crews soon became covered with sand and submerged by the advancing Gulf. They disappeared from view – but only temporarily. Weather events that bring rough waves and high tides often uncover the pieces, sometimes picking them up and spreading them spread across the beach and into adjacent marshes. That happened again in October, during Tropical Storm Karen, which limped across the southeast Louisiana coast as a tropical depression. The Coast Guard assessment team that searched the Fourchon Beach area hadn’t expected to find much. That made the recent discovery of a large mat surprising, public information officer Michael Anderson said. “That was a big mat – we collected 53,000 pounds from that one site,” he said. The size of the mat triggered another search. During the spill the parish and state had used booms and other material to block four channels leading from the beach to the interior marsh in an effort to keep the oil from coating vegetation. It was a prudent decision; the beach area became one of the most heavily oiled in the entire Gulf. “During the spill we collected a lot of oil that was building up against those structures,” Anderson said. But as time went on, storms and shoreline changes buried the structures. When the post-Karen mat was discovered in one of those channels, the search was on for the remaining three. It paid off. One site, which is still under excavation, has yielded 780,000 pounds; another 53,000 pounds were found at the third site; the third contained 320 pounds, and the fourth was clean. Discovery of those buried deposits proved the wisdom of what’s called the Louisiana Augering and Sequential Recovery Program, which involves boring holes through the beach layers about every 30 feet. Anderson said about 5,800 holes were bored over 5.8 miles of Fourchon Beach — 14,366 across Louisiana beaches in total. 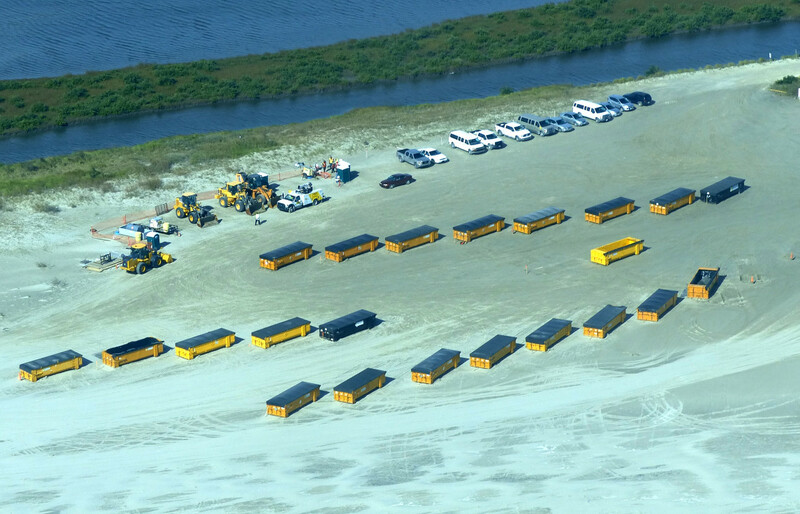 A caravan of loaders testifies to the amount of oily gunk uncovered near Fourchon Beach in recent weeks. The need for such thorough investigation was obvious after tar mats laid bare by storm action showed that BP’s oil is so prevalent in some areas that the Coast Guard resorted to doing complete beach restorations. So far the program has led to removal of 4.7 million pounds of oily muck. Most of it was sand, but sand so laden with oil that removal was the only option. But as Barham, the Wildlife and Fisheries chief, knew two years ago, the work in fact is far from complete. “We do have new tar balls coming ashore on these new beaches,” Anderson said. “This Fourchon area is really the most problematic place in the entire area of operation – the entire Gulf from Florida to Texas. And in Louisiana, coastal storms aren’t going to stop anytime soon. This story was modified after publication to include a comment from BP and to remove the reference to how much the shoreline has retreated because The Lens has received conflicting information about the extent of the loss. Why did BP’s stock rise after the settlement was reached: payments are low and slow — except to lawyers.